(Collagen production stimulated by the heat) + No Pain ! A technique that tightens facial skin. The treatment area is measured and cooled for comfort. Then, a treatment tip is placed against the skin and radio frequency energy penetrates the skin. Collagen production is stimulated by the heat and isn't painful. Micro Needling uses HGMF. This is a Fibroblast cytokines complex which is essential in cell differentiation and regeneration. 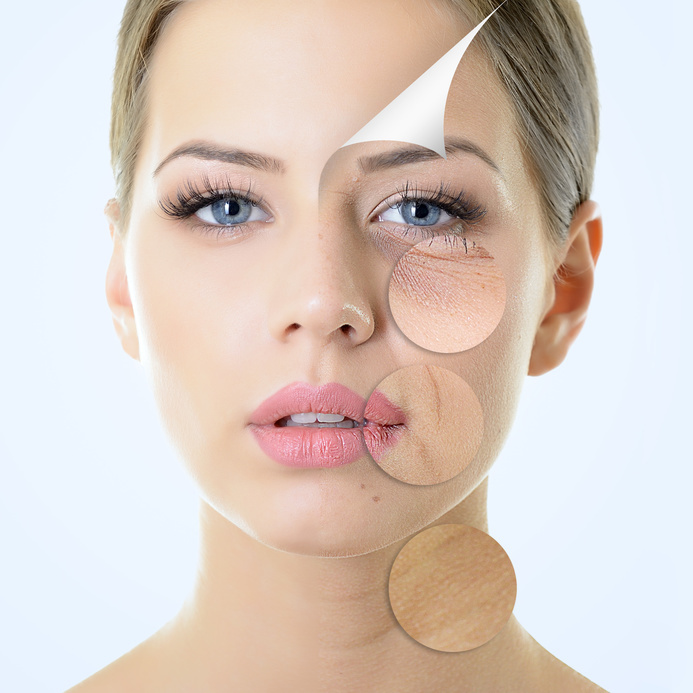 Fibroblast works as the most important role in skin regeneration processes after 3 days. A fibroblast is a type of cell that synthesizes the extracellular matrix and collagen, the structural framework for skin tissues, and plays a critical role in wound healing. Fibroblasts are the most common cells of connective tissue in skin tissues. Three weeks after applying, HGMF improves acne, scar and pigmentation by getting involved in skin cell regeneration. Skin texture and tone will be improved in a short time. This facial is extremely useful and one of the most popular facials within our business. We promise you will be satisfied! A classic facial is the perfect way to relax and keep your skin healthy. This includes cleaning, exfoliating, and massaging the skin. A face mask will be applied depending on your skin type and then finished with toners and moisturizers. You'll have an extremely fresh face! This facial combines the process of chemical peeling and mechanical peeling. Peeling combines a variety of AHA and BHA in order to dissolve dead skin cells in pores. This is pain and scar-free. Your skin will be moisturized, deep cleaned, detoxified, and have less fine lines. Cryotherapy is based on electrophoresis which is combined with cool/hot electric stimuli and iontophoresis. Ionzymes deliver cool/hot energy to the skin for freckles, pigmentation after inflammation, wrinkles, anti-aging, acne, whitening, and lifting. Beta Carotene, AHA, Vitamins A, C, and E are deeply massaged into the skin. The main focus of our back facial service is to improve the health of the skin while providing a deep moisturizing treatment. The back facial begins with deep cleansing exfoliation, and essential masque will leave you relaxed and your skin radiant. Also a relaxing neck, back, and shoulder massage is included. Only 3% of active ingredients can pass through skin layers. But this facial can puncture the epidermis using a new pathway solution with a multi-needle! The advanced anti-aging facial combines the Aqua, Cryotherapy, and Micro Needling facial into one. This restores skin cells without any physical damage. Benefits include: collagen regeneration, reduced wrinkles and pigmentation, improved skin tone, activated skin cell restoration ability, and increased skin tightness and elasticity. A sufficient amount of active ingredients reach the dermal area and regenerate without any physical damage to the epidermis. Acne scars and stretch marks are reduced as well! This facial provides everything our customers need and is the best facial for anti-aging! © 2017 Permanent Makeup & Lash by Christine | Developed by TAF JK Group, Inc.